Son of the late Mr. Thomas Chamberlayne, owner of the famous Arrow, was born in 1843, and educated at Eton and Magdalen College, Oxford. The family of Chamberlayne claim descent from the Counts of Tankerville, hereditary Chamberlains to the Duke of Nor­mandy. Arrow, winning at Dover, 1876. From a picture in the possession of Mr. Tankerville Chamberlayne. Mr. Thomas Chamberlayne came into prominence in yacht-racing history when he purchased the Arrow, which was built by Mr. Joseph Weld, and from that time the family name has been intimately and actively associated with the sport. The original Arrow was built in 1825. She was a cutter of 84 tons, length 61 feet 6 inches, beam 18 feet 5½ inches. She had only a short-lived racing career with Mr. Weld, who laid her up in favour of a new vessel, and it was not till 1845 that she passed into Mr. Thomas Chamberlayne’s hands. Mr. Chamberlayne is justly proud of his ownership of this celebrated vessel, the name of which stands out before that of any other in the history of British yachting with a record even more unique than that of the famous America. The remarkable history of the Arrow under his ownership will be found in another section of this work. 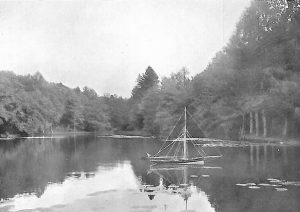 12-foot model of Arrow taken on the lake at Cranbury Park, Winchester. Almost all that now remains of the famous old cutter is a large and beautiful model built from her materials and on her exact lines for Mr. Tankerville Chamberlayne by Messrs. Summers and Payne of Southampton. This model is moored on the lake at Cranbury Park. The Arrow, it may be mentioned, won the first cup ever given by the King, and the first and last given by the Prince Consort, as well as the cup designed by the late Queen Victoria. 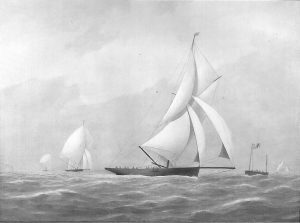 She was the only English yacht that ever captured a cup from the famous America—viz., the Queen’s Cup at Ryde in 1852—and she can claim never to have been beaten by the America, seeing that, although she was in the historic race at Cowes in 1851, she ran aground near the Needles, and was therefore put out of the race. The King when Prince of Wales sailed his first yacht race on the Arrow. Besides owning the famous cutter, Mr. Thomas Chamberlayne designed and built the cutter Rosebud and the celebrated 12-tonner Quiver. The former was owned by his son-in-law, Sir B. Chichester, and afterwards by the Duke of Connaught. She was the winner of several prizes. The Quiver was for many years invincible in her class, and on one occasion in a Thames match she over­took the yachts in the larger class, which was started before the smaller-class race, and led both fleets home. Mr. Tankerville Chamber­layne built at his private yard in 1895, from designs by Mr. Dixon Kemp, the screw schooner Amazon, 100 tons. He is a keen, enthusiastic yachtsman, and worthily maintains the yachting traditions of the family. In the South of England, where he owns large estates, he is extremely popular, and is lord of the Manors of Hound, North Baddesley, and Otterbourne, Hants, and East Norton, Leicestershire. He was three times in succession elected M.P. for Southampton, and headed the poll on each of these occasions. He is also Commodore of West Quay Regatta Club. Clubs: Royal Albert, Royal Cinque Ports, Royal Harwich, Hythe, Royal Plymouth Corinthian, Royal Southern, Royal South­ampton, Southampton Corinthian, Royal Thames, Royal Victoria, Royal Western of England, West Quay Regatta. Address: Cranbury Park, near Winchester.